Line cookie sheet with waxed paper. In large bowl, mix egg, bell pepper, green onions, parsley, mayonnaise, seafood seasoning and mustard. Gently stir in crab meat and Swiss cheese. Season to taste with salt and pepper. Shape into 8 patties. Dip both sides of each crab cake into bread crumbs, pressing crumbs into cake with hands to completely cover; place on cookie sheet. Refrigerate about 20 minutes to firm up crab cakes. In 12-inch skillet, heat oil over medium heat. Add patties; cook until golden brown on both sides, being very careful when flipping so patties do not fall apart. Serve warm with tartar sauce. Crab cakes can be made ahead and kept in the refrigerator, covered with plastic wrap, until ready to fry. 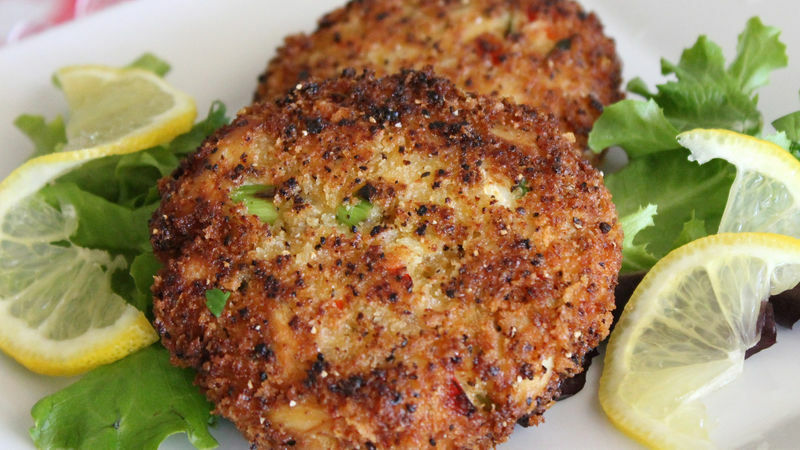 Crab cakes can also be broiled on a lightly greased cookie sheet for 8 to 10 minutes without turning or until they are golden brown.